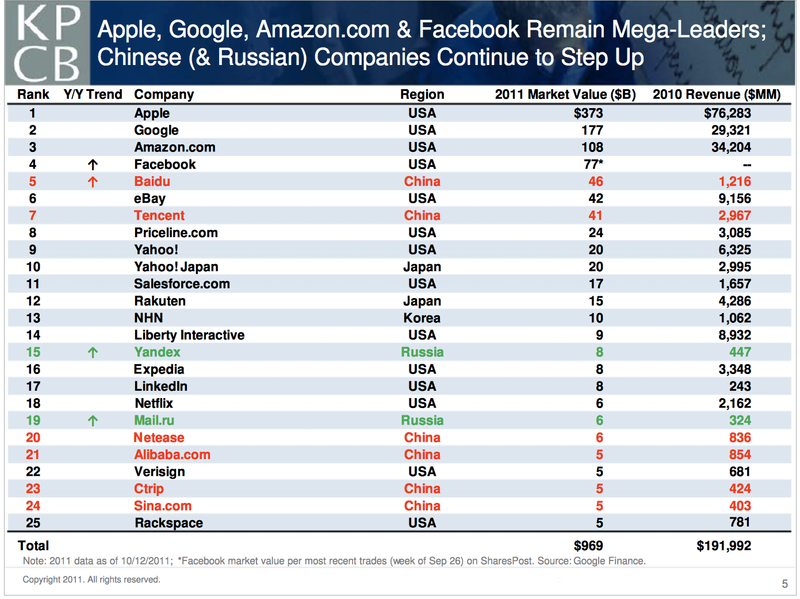 Facebook was identified as a “mega-leader” across the globe, fourth only to Apple, Google and Amazon.com. The company’s estimated market value is $77B, with revenues going nowhere but up — impressive given the trodden tech giants ahead of the social network on the list. The majority of visitors to the mega-tech leader sites listed in the slide above are actually from outside the US — 81% to be exact. According to Facebook’s statistic page the social network is just under this trend, with 75% of it’s 800 million active users residing outside the United States. 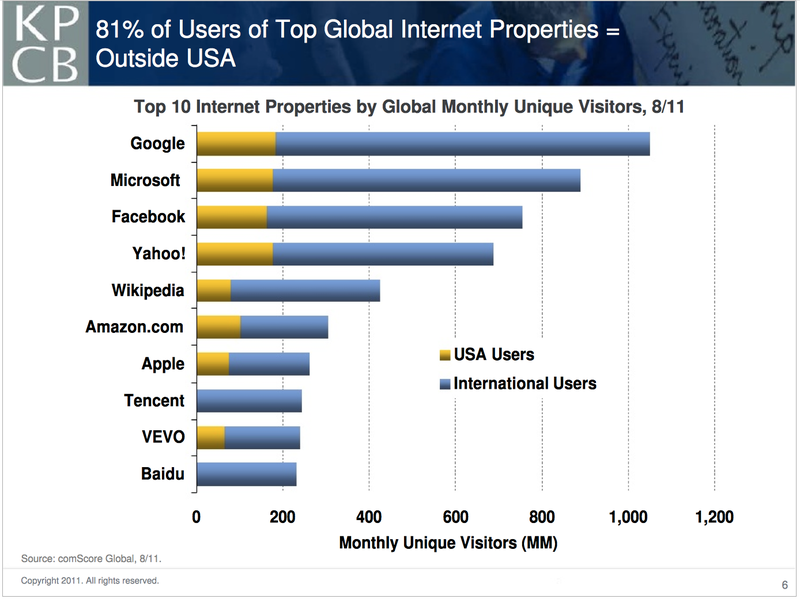 Facebook was also pulled out as a reference point for how large and quickly mobile usage is growing across the globe. 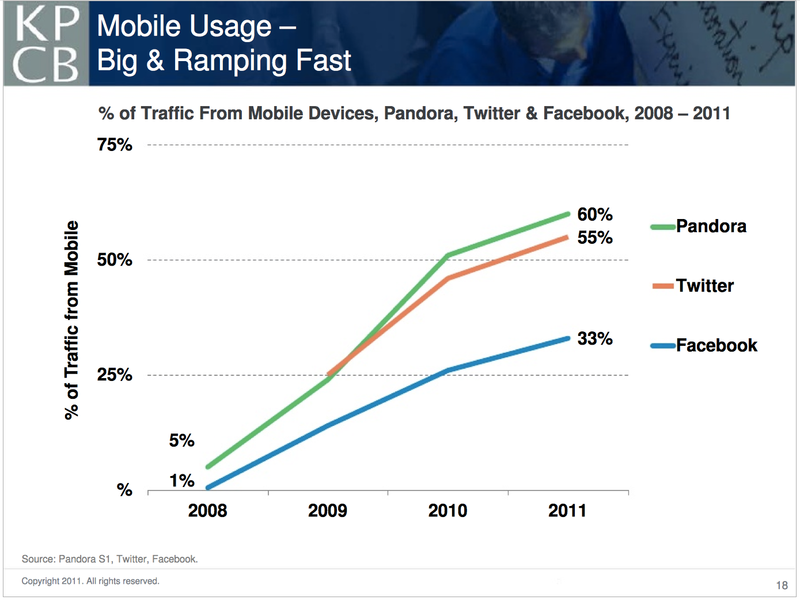 While accessing Facebook from smartphones has grown steadily since 2008, it is interesting to see that mobile consists of a much smaller portion of overall traffic to Facebook when compared to Pandora and Twitter. It’s not that surprising considering points like that Facebook just released its official iPad app and that gaming apps on the social network are inaccessible via mobile. Overall, the slide relays how much opportunity Facebook has yet to capitalize on on the mobile front. 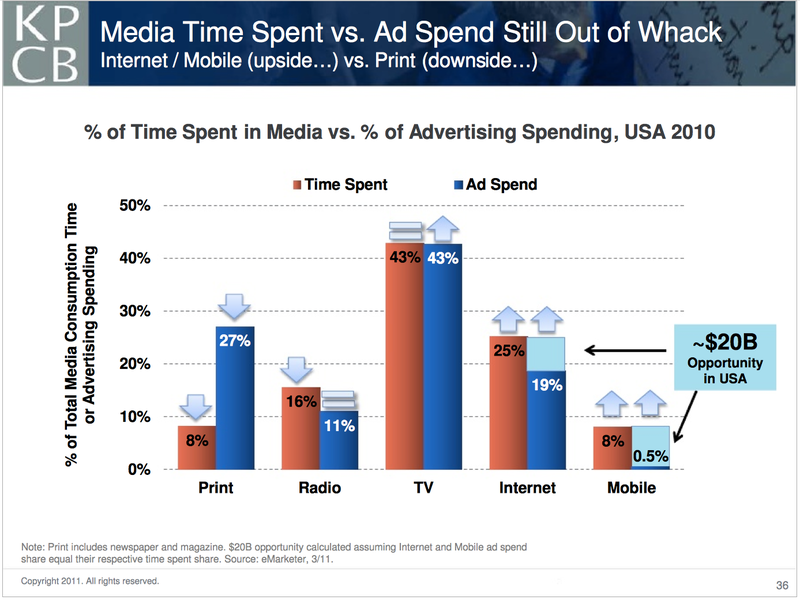 As for trends in online advertising, Meeker and KPCB show in the below slide the media on which ad dollars aren’t proportional to media consumption time: the Internet and mobile. While Facebook isn’t mentioned specifically on this slide, we calculated how considerably ad spend lags user numbers on the social network when compared to traditional mediums — even the Internet as a whole (featured on Business Insider just last week). Social networks have “begun to punch closer to their weight” on the CPM front, according to Meeker and KPCB. 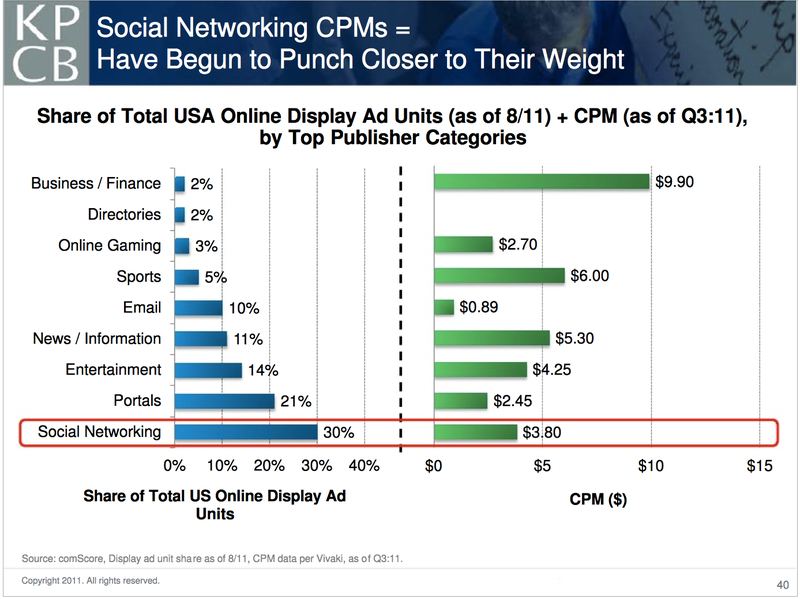 Social networks (Facebook being by far and large the dominant one) publish the largest fraction of online display ad units, while respective CPM rates are smiddle-of-the-road. Meeker’s closing thoughts on the 2011 tech industry: despite the economy, these are “unprecedented times.” We’d encourage you to read her presentation in full here, covering everything from the state of the economy to the user interface revolution.